The Holy Father thanked the group for their prayers and the special care they show for the environment. 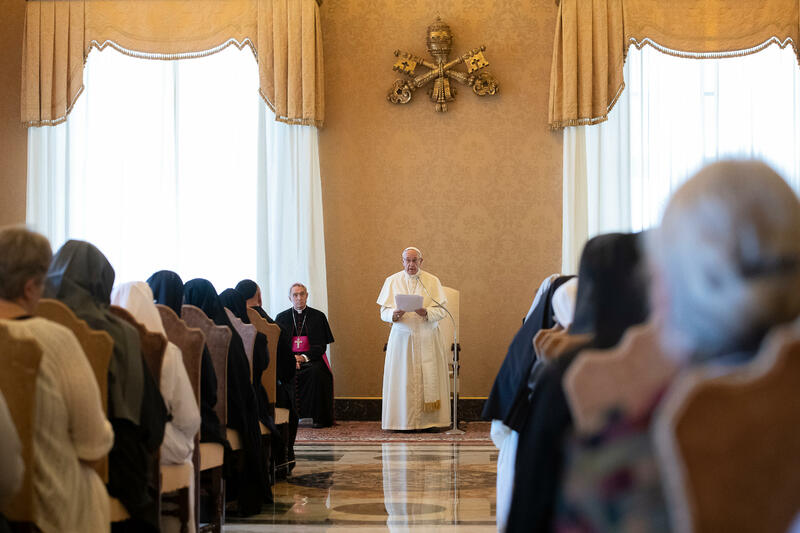 “I know that the Benedictine nuns and sisters in the world are good administrators of God’s gifts,” the Pope said. Welcome to Rome! I thank Father Primate for his words of introduction: I have told him that his Italian has improved! Your Symposium is a good occasion for Benedictine nuns and sisters from all over the world to experience together a period of prayer to reflect on the various ways in which the spirit of Saint Benedict, after fifteen hundred years, continues to be vibrant and fruitful today. I am spiritually close to you during these days of your meeting. For your theme, you have taken an exhortation from the fifty-third chapter of the Rule of Saint Benedict: “All are to be welcomed as Christ”. This expression has given the Benedictine Order a remarkable vocation to hospitality, in obedience to those words of the Lord Jesus which are an integral part of his “rule of conduct” found in Saint Matthew’s Gospel: “I was a stranger and you welcomed me” (25:35; cf. Gaudete et Exsultate, 102-103). Today there are many people in the world who seek to reflect in their lives the tenderness, compassion, mercy, and acceptance of Christ in their lives. To them, you offer the precious gift of your witness, as you are instruments of God’s tenderness to those who are in need. Your welcoming of persons of different religious traditions helps to advance with spiritual anointing ecumenism and interreligious dialogue. For centuries, Benedictine houses have been known as places of welcome, prayer and generous hospitality. I hope that by reflecting on this theme and sharing your experiences, you may find new ways of furthering this essential work of evangelization in your various monasteries. The motto Ora et Labora places prayer at the center of your lives. The daily celebration of Holy Mass and the Liturgy of the Hours puts you at the heart of the Church’s life. Every day, your prayer enriches, in a manner of speaking, the “breathing” of the Church. It is a prayer of praise to express the voice of all humanity and all creation. It is a prayer of thanksgiving for the countless and continued blessings of the Lord. It is a prayer of supplication for the sufferings and anxieties of the men and women of our time, especially the poor. It is a prayer of intercession for those who endure injustice, wars, and violence and see their dignity violated. You do not meet these people personally, but you are their sisters in the Faith and in the Body of Christ. The value of your prayer is incalculable, yet surely it is a most precious gift. God always hears the prayers of hearts that are humble and full of compassion. I want to thank you for the special care you show towards the environment and for your efforts to protect the gifts of the earth so that they can be shared by all. I know that the Benedictine nuns and sisters in the world are good administrators of God’s gifts. As women, you feel and appreciate especially the beauty and harmony of creation. Your monasteries are often found in places of great beauty where people go to pray, to find silence and to contemplate the marvels of creation. I encourage you to continue this style and service so that God’s wonderful works can be admired and speak of him to many persons. Your life in community bears witness to the importance of mutual love and respect. You come from different places and experiences, and each of you is different, and so the way you accept one another is the first sign you offer in a world that finds it hard to live out this value. We are all children of God and your prayer, your work, your hospitality, your generosity, all combine to reveal a communion in diversity that expresses God’s hope for our world: a unity made of peace, mutual welcome, and fraternal love. Dear Sisters, I accompany you with my prayers. You bring a precious gift to the life of the Church through your feminine witness of goodness, faith, and generosity, imitating the Holy Mother of the Church, the Virgin Mary. You are icons of the Church and of our Blessed Mother: do not forget this. Icons. Who sees you, sees the Church as Mother and Mary as Mother of Christ. For this, we praise the Lord and we thank you. I ask you please to pray for me and I cordially bless you and your communities, and all whom you serve in the name of Christ. Thank you!